Born to wealthy pagan parents. Taught rhetoric and literature. Adult convert in 246, taught the faith by Saint Caecilius of Carthage. Ordained in 247. Bishop of Carthage in 249. During the persecution of Decius, beginning in 250, Cyprian lived in hiding, covertly ministering to his flock; his enemies condemned him for being a coward and not standing up for his faith. As a writer he was second only in importance to Tertullian as a Latin Father of the Church. Friend of Saint Pontius. Involved in the great argument over whether apostates should be readmitted to the Church; Cyprian believed they should, but under stringent conditions. Supported Pope Saint Cornelius against the anti-pope Novatian. During the persecutions of Valerian he was exiled to Curubis in 257, brought back Carthage, and then martyred in 258. His name is in the Communicantes in the Canon of the Mass. Born to the Spanish nobility. Well educated, his father planned a career for Raymond in the royal court in Aragon (part of modern Spain). When Raymond felt drawn to religious life, his father ordered him to manage one of the family farms. However, Raymond spent his time with the shepherds and workers, studying and praying until his father gave up the idea of making his son a wordly success. Mercedarian priest, receiving the habit from Saint Peter Nolasco, the order's founder. Master-general of Mercedarian Order. Spent his entire estate ransoming Christians from Muslim captors, then surrendered himself as a hostage to free another. Sentenced to death by impalement, he was spared because of his large ransom value. Imprisoned and tortured, he still managed to convert some of his guards. To keep him from preaching the faith, his captors bored a hole through his lips with a hot iron, and attached padlock. Raymund was eventually ransomed, returning to Barcelona, Spain in 1239. Created cardinal by Pope Gregory IX, Raymond continued to live as a mendicant monk. He died while en route to Rome to answer a papal summons. The son of Francesco and Carmen Tarrés i Claret, he and his sisters Francesca and Maria, both of whom became Conceptionist nuns, were raised in a Christian home. Due to his father‘s work as a mechanic, the family moved regularly. He received Confirmation on 31 May 1910, and his first Communion on 1 May 1913. Pere was educated by the Piarist Fathers and Jesuits, helped in a local pharmacy, and graduated from the College of Saint Ignatius. He studied medicine at the University of Barcelona, and attended the Oratory of Saint Philip Neri. Member of the Federation of Young Christians and Catholic Action. Pere’s father died in July 1925, and not long after his mother was in an accident that left her crippled for life. Received his degree in medicine in 1928. With Dr Gerardo Manresa, he founded the Our Lady of Mercy clinic in Barcelona which concentrated on treating tuberculosis patients. Pere was on a spiritual retreat at the Montserrat monastery when the Spanish Civil War broke out and its anti–Christian persecutions began. He continued working at the clinic, and secretly bringing Communion to covert Catholics. Drafted by the Spanish Republic in July 1938 to serve as an army doctor, receiving the rank of captain. Along with treating patients, he studied Latin and philosophy, and after the war he taught at the University of Barcelona. He entered Barcelona seminary on 29 September 1939, and was ordained a priest in the archdiocese of Barcelona on 30 May 1943. Studied theology at the Pontifical University in Salamanca, Spain, receiving his degree on 13 November 1944. Served as an official in Catholic Action, was active in parish youth ministry, and as chaplain of women‘s religious houses, including the Franciscan Sisters of the Sacred Heart. Taught moral theology and served as confessor at the seminary in Barcelona. Father Pere was diagnosed in May 1950 with an aggressive form of cancer. His health went rapidly downhill, and he offered his final months of suffering and death for the sanctification of his brother priests. Monk at Iona, Scotland. Studied under Saint Senan at Inish Cathay. Bishop of Clogher, Ireland. Resigned the see to became a monk at Iona c.630. 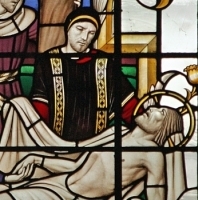 Evangelizing bishop in Northumbria, England at the behest of his friend the king, Saint Oswald of Northumbria. Once when pagans attacked Oswald's forces at Bambrough, they piled wood around the city walls to burn it; Saint Aidan prayed for help, and a change in wind blew the smoke and flames over the pagan army. Aidan was known for his knowledge of the Bible, his eloquent preaching, his personal holiness, simple life, scholarship, and charity. Miracle worker. Trained Saint Boswell. Founded the Lindesfarne monastery that became not only a religious standard bearer, but a great storehouse of European literature and learning during the dark ages. Saint Bede is lavish in his praise of the episcopal rule of Aidan. Wealthy Israelite owner of tin mines in Cornwall. May have been related to Jesus, and certainly was a disciple and student. He is the noble counselor mentioned in the Gospel of Mark. Provided the tomb for Christ, and with the help of Saint Nicodemus, interred Jesus. Tradition says he brought the Faith and the Holy Grail to England. When he planted his traveller's staff in Glastonbury, it took root and became a thorn tree which flowered each Christmas Day. Merciful God, whose servant Joseph of Arimathaea with reverence and godly fear, prepared the body of our Lord and Savior for burial, and laid it in his own tomb: Grant to us, your faithful people, grace and courage to love and serve Jesus with sincere devotion all the days of our life; through Jesus Christ our Lord, who lives and reigns with you and the Holy Spirit, one God, for ever and ever. Member of the Salesians, making his novitiate in Carabanchel Alto, Spain, and making his religious profession in 1918. He studied philosophy and education in Carabanchel Alto, Barcelona and Baracaldo. Teacher in Havana, Cuba in work that substituted for mandatory military service. Ordained a priest in 1927, and assigned to Carabanchel Alto for six years. He also worked in the Spanish cities of Bilbao and Madrid. Served as teacher, counselor, catechist and spiritual director at the San Miguel Arcángel School on the Paseo de Extremadura in 1933 till 1936; remembered by former students for his deep spiritual life, his strict personal adherance to Salesian principles, and as a counselor who could reach them on their own level in spiritual and academic matters. At the outbreak of the Spanish Civil War, Father Germán and the other Salesians were forced to abandon the school and go into hiding. Seized at a boarding house in Madrid on 30 August 1936 and executed the next day for the crime of being a priest. Member of the Brothers of the Christian Schools (De La Salle Brothers); he entered the novitiate on 3 August 1898, taking the name Edmigio; he received the habit on 8 October 1898, and his perpetual vows on 11 August 1911. Taught in several schools and in Saint Joseph College in Almería, Spain. Arrested by the anti-Catholic Popular Front forces in the Spanish Civil War, and executed for the crime of teaching Christianity. One of the Martyrs of Almeria killed during the Spanish Civil War. Born to the nobility, the brother of Count Dotto Dotti. A career soldier, he rose to the rank of captain of archers in the army of Philippe the Fair. Though he grew up a courtier and lived as a soldiers, Andrew was always drawn to religious life. In 1278, after hearing a sermon by Saint Philip Benizi, he joined the Servite Order, being received into the Order by Saint Philip himself. Priest. Held several offices in the Order. Noted preacher and sought after confessor. Known in his day for his personal penances. Visionary and miracle worker. Late in life he retired to Montevecchio to spend his final days in prayer and solitude. Member of the Sanhedrin in Israel during the life of Jesus. He was a secret disciple of Christ, meeting him by night to avoid the wrath of the other members of the Sanhedrin, and eventually spoke out to that body to remind them that Jesus had a right to a hearing. 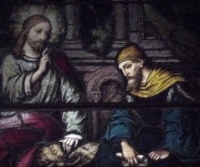 With Saint Joseph of Arimathea he prepared Jesus' body and placed him in the tomb. There was an apocryphal "gospel" that was purported to have been written by him; it is sometimes entitled the Acts of Pilate. Tradition says he was a martyr, though no details have survived. Missionary to Germany where he worked with Saint Maximinus in the area of Trier. Bishop of Trier in 349. Strongly supported Saint Athanasius of Alexandria, which led to him being exiled to Phrygia, Asia Minor by the Arian Emperor Constantius in 355; he was never able to return to his diocese; he died in exile, and thus is considered a martyr. Early Christian writer and philosopher. Taught philosophy in Athens, Greece. Presented an explanation of Christianity to Emperor Hadrian in 133, a work inspired by the persecution of Christians, and which led to an imperial decree that paused the imperial anti–Christian policy. Wrote an account of the Passion of Saint Dionysius the Areopagite. Franciscan Friars Minor (Observants) priest. Chosen bishop of Mayo, Ireland in 1576 by Pope Gregory XIII. Martyr. Sister of King Ina of Wessex in England; sister of Saint Cwenburgh of Wimborne. Benedictine nun at Barking Abbey in Essex, England where she was a friend of Saint Hildelith. With Cwenburgh, she founded a monastery in Wimborne, Dorset, England, and served as abbess there. Many of her Wimborne sisters worked as missionaries to Germany. Franciscan Friars Minor (Observants) priest. Martyr. Son of Saint Rufinus. Priest. Imprisoned, tortured and martyred in the persecutions of Maximinus with several fellow Christians, including Saint Placidus and Saint Eutychius, but most of whose names have not come down to us. While in prison, he ministered to other prisoners, and converted some who were pagans. Sister of King Ina of Wessex in England; sister of Saint Cuthburgh of Wimborne. Benedictine nun. With Cuthburgh, she founded a monastery in Wimborne, Dorset, England, and served as abbess there. Many of her Wimborne sisters worked as missionaries to Germany. Married to Saint Rufina of Caesarea. Father of Saint Mamas. Martyred in the persecutions of Aurelian. Married to Saint Theodotus of Caesarea. Mother of Saint Mamas. Martyred in the persecutions of Aurelian. Foster-mother of Saint Mamas. Martyred in the persecutions of Aurelian. Bishop of Auxerre, France c.529.